Decentralization of Parliament and Elections of MCEs/DCEs in Ghana: Can we have another referendum? WE THE PEOPLE MATTER MOVEMENT have come up with a proposal and are calling on other Ghanaians to join us in demanding that the government overhaul the current governance institutions in our country through a constitutional amendment. As detailed by Acemoglu and Robinson in their famous book “Why Nations Fail”, poor institutions are the focus of their work. Institutions are the vehicles that drive a country towards growth and prosperity. Therefore, if after 61 years as a country we are still behind in development as compared to the rest of the world and other African countries like Rwanda, we must go back to the drawing board and re-evaluate our governance institutions. 1. Decentralization of our current parliament into 16 regional parliaments. 2. The elections of Assembly executives (MCEs/DCEs). We would like to share with you what prompted us to make this proposal. Currently in Ghana, NDC and NPP is a second religion which most Ghanaians belong to just as they belong to either Christianity or Islam. You may disagree with this statement, but it is a sad reality. Once you explore the cities, villages, and the zongos it becomes apparent that nationalism is dead and buried, and we are now left with the idea of “us versus them”. Amongst these, the majority of Ghanaians wallow in abject poverty with no hope of prosperity for themselves and their unborn generations, while the political class and their families and friends enjoy an abundance of wealth daily. For instance, how do you justify a constitutional provision that allows an Hon. MP, Minister or government appointee to receive an Ex Gratia payment at the end of a 4-year service term that is a million folds more than what a teacher or a nurse will receive as pension from SSNIT at the end of his/her 30 years of service to the nation? Is Ghana an animal farm where “four legs good and two legs bad?” Are we saying every Ghanaian must be a politician before they can earn a decent wage or pension for themselves? Or are we saying other professions do not matter and are not services to the nation? Over the past 61 years of Ghana’s independence, the people of Ghana have basically demanded seven (7) life-necessities from leadership: security, roads, electricity, water, health, education and jobs. Ghanaians are not demanding our politicians to launch a satellite into space or to compete for world supremacy against the likes of America, Russia, or the up-coming China. Unfortunately, we have received so many promises with little delivery. All we see and hear now are recycled promises from political parties every election season. The creation of six (6) new regions means political leadership can implement whatever the people of Ghana want and need; after all, rules are made by leaders and can definitely be amended by leaders to benefit the nation and not just few politicians. Therefore, we are calling for amendments to our constitution so we can have a “full” decentralization by moving our Hon. MPs back to their various regions to constitute a regional parliament. This will help decongest Accra and also create more investment opportunities and development in other regions. The MPs can move back to their regions and form a regional parliament. MPs have three (3) main responsibilities: to represent their constituents, the legislature (parliament), and their party. As the people’s representatives, they are NOT responsible for developmental projects in their constituencies, but they have the power to lobby for developmental projects for their constituents from the central government and other sources. As legislators, they “police” the executive arm of government and assist in passing laws for the country. Their third responsibility is that they represent their party and usually support their parties’ interest by voting on matters in parliament that their party leadership wants. In all these three (3) responsibilities, the last (the party’s interest) seems to be the focus of our current legislators since 1992, which has stagnated Ghana’s development as the national interest is of lesser importance. MPs, with expectations of being appointed by their party as ministers of states and into other board membership positions, end up being more concerned about their party’s interest when voting in parliament than the interest of their constituents/nation. WE THE PEOPLE MATTER MOVEMENT are of the view that the country can change this party line of voting by constituting regional parliaments. Voting will then we carried out at the regional levels devoid of partisan interest. In our opinion, this parliamentary decentralization will help bring an end to the majority and minority “sickness” that stagnates the rate of Ghana’s development. For example, if MPs in the new Gonja region (Savana) choose to go to their regional parliament and do the minority and majority fanfare instead of uniting to put pressure on the central government to develop their region, “that should be their own cup of tea” and surely Gonjas as a people will know it is their own kinsmen who have failed them and not the central government. This new system would also help create more jobs at the central government level. For instance, with the current parliamentary system, the constitution requires almost 50% of ministers of state to be MPs. This implies that an MP can also be appointed as a minister and again a board member to more than one institution. Upon basic analysis, an MP can collect the salaries/benefits of 3 different positions. With the new decentralized system, we can create a constitutional provision such that MPs would no longer hold ministerial appointments or board member positions. Such positions should be reserved for other citizens, too. This will separate the legislative arm completely from the executive and ensure proper policing of the executives by the legislators. We are also of the view that this proposal would not be a hindrance to an MP’s roles of policing the executive as well as passing laws. For instance, in our current parliament, if the NPP government wants to introduce a new tax law, it has the majority seats in parliament, so such a law can be passed easily even if it is not in the best interest of Ghanaians. Under a regional parliament system, the tax bill could be passed onto the regional parliaments by the minister for governmental affairs (a position that can be created at the national level to handle government business in the 16 regional parliaments). The regional parliaments could then hold debates to decide whether the bill is good for the nation and vote afterwards as a region and not as NDC/NPP. Depending on the duration that is given for each region to hold their debates, voting could then be done in their regional parliaments and the results submitted to the central government on the number of Yes/No votes from each regional house of parliament. Total coalition and publication of the votes from each region would tell if the country wants the tax bill passed into law or not. There would no longer be the majority “carry the day kind of voting” that has characterized our parliament since 1992. If there is the need for all parliamentarians to hold a sitting together, the nation can make provisions for that in the amended constitution. When it comes to policing the executive arm of government, the impression should not be created as if MPs need to be in Accra in order to be able to perform this function effectively. At their regional levels, they could still perform their functions. In this 21st century, there are even institutions and bodies that are not located in Africa but are effectively policing African countries’ executives’ arms of government of which Ghana is not an exception. Also, what we are proposing, if adopted, would not change Ghana into a federal state. It would keep Ghana represented as a unitary state with power belonging to the central government. The only thing new here is that, instead of our Hon. 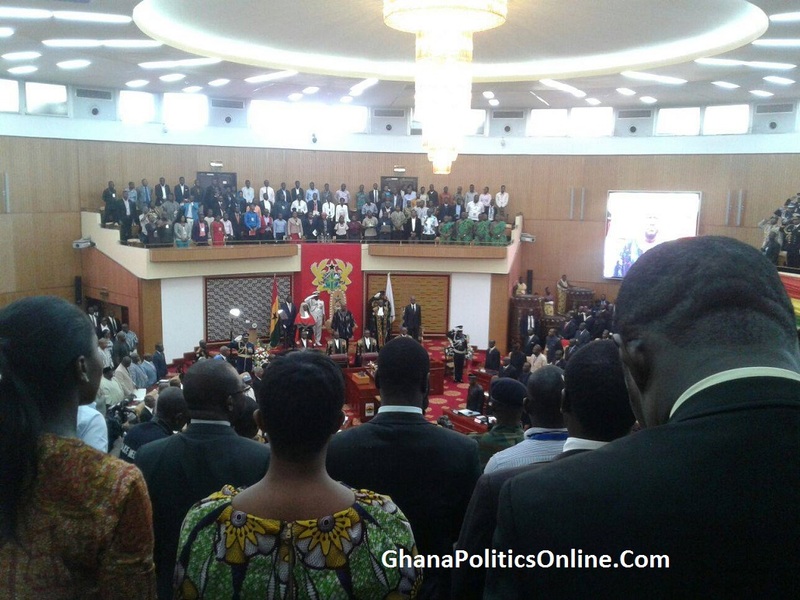 MPs all migrating from their regions to Accra to form a national house of parliament, they would be in their regions and the idea of national parliament be abolished. This would still give Ghana the ability to run one legislative arm of government, decentralized into sixteen (16) regional parliaments, thus avoiding a transition from our unitary system to federalism. 1. The National Assembly: based in the national capital (Abuja) and divided into the Senate (upper house) and the Federal House of Representatives (lower house). 2. State house of Assembly: Nigeria has 36 States and each State has a legislative house of Assembly. 3. Local government legislative house: Nigeria has 700+ local government areas with each having a local government legislative house. 1. National House of Parliament: based in Accra and represented by each constituency from the regions. Regional house of Parliaments, represented by each constituency from the regions. This new system would meet the needs of our people and also make our unitary system unique from what we have copied from the British for 61 years. Also, regarding resource allocation and distribution, we do not think any region in Ghana can tell how much revenue is generated from their region, for there to be any controversies. Ghana has a consolidated fund account where all the revenue generated by government is deposited and used for developmental projects throughout the country. The decentralized parliamentary system would not be a hindrance to revenue collection and disbursement. Constitutional amendments could make provisions for all these arrangements. Looking at our current democratic system of “8 years for NDC and 8 years for NPP (since 1992)”, one can see that our politicians will never be solidly united on a common cause to develop Ghana. It is more about parties’ interests and how to win the next year (every 4 years) than on advancing national development. Proceedings from parliament show it is always a blame game when either NDC or NPP is in power, and their “majority always carries the day” occurs in the passage of bills/laws whether it is in the national interest or not. 2. The elections of Assemblies executives (MCEs/DCEs). The second proposal we are calling for is to implement the elections of Assembly executives on political party lines. The appointment of MCEs/DCEs by the executive arm of government at our local government areas has also affected the development of those areas negatively. MCEs/DCEs are more concerned about their party’s interest and how to use their positions as a stepping stone to contest an MP’s position. This makes the MCEs/DCEs very much unconcerned about development at their local levels. We are proposing that the local areas be made to elect their MCEs/DCEs. If, for instance, the people of the Kumasi metropolitan assembly elect an NPP candidate as their MCE under an NDC government in power, it will strengthen our democracy at the local level and reduce the “too much” power of the central government. The NPP MCE in Kumasi will put the NDC government on its toes (either through taking the government to court or other means) to make sure the government doesn’t delay in the release of funds to their metropolis. Furthermore, since the MPs represent the constituencies in the various regions, they are more abreast with the developmental needs of their people, so collectively as MPs in the regional parliaments, they can put more checks on the elected MCEs/DCEs to ensure basic development needs are met in the respective constituencies. The regions can also collect local taxes to help finance some of their yearly projects. Basic life-necessities such as local road construction, street light improvement, water supply, electricity, regional peace, and other projects in the regions should be the concern of the local government assemblies and monitored by their regional parliaments. Together, they should handle the task of developing their own region. For instance, the people of Yendi should not be blaming the central government for their water problems. That should be handled at the regional and local levels. The central government, on the other hand, can then focus on national security, job creation, and developing transportation networks that will link all the regional towns for easy flow of goods and services, and also ensure the overall macro stability of the economy. We conclude by saying that, when Cleisthenes, in Athens, in 510 BC, first thought about democracy and suggested it to his people, his thoughts may have been considered to be unfeasible. However, currently, almost the entire world practices this form of rule of the people although executed in different forms unique to their nation’s culture. Can Ghana also create a unique form of unitary system for its people? Can we drift away from the current British system of governance we are practicing, which seems to keep the majority of the population struggling with poverty, hunger and disease, at the benefit of the elite and ruling class? Member, WE THE PEOPLE MATTER MOVEMENT.